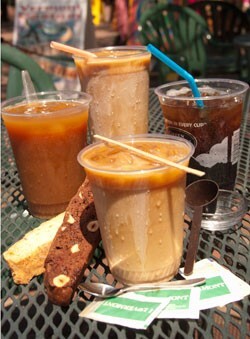 One of the quintessential sounds of summer is the clinking of cubes inside a tall, glass of bracing iced coffee. Recently, when the sun finally appeared and Vermonters actually broke a sweat, some readers clamored via Twitter for a Seven Days survey of local brews. The sizable number of staffers who fuel their workdays with cold java happily agreed to sample the options. While there was no problem finding volunteer tasters, narrowing the large number of available iced coffees was daunting — we simply couldn’t try them all in one sitting. Readers were quick to recommend their favorites, and staffers have their own: the brew with coffee ice cubes at Winooski’s Block Gallery, for instance, or the robust Vermont Coffee Company roast at several local markets. In the end, we decided the contestants should hail from dedicated coffee shops within the Burlington city limits. We narrowed the field to seven contenders: Bluebird Coffee Stop, Maglianero, Muddy Waters, Speeder & Earl’s, Starbucks, Uncommon Grounds and Viva Espresso. On judgment day, the testers gathered for a blind tasting from two glasses each of the seven coffees: one black, one with milk. The glasses were identified by numbers only. The judges circled a table set up with the anonymous contenders and aimed their straws at each. They thoughtfully sniffed, observed, sipped and scribbled down notes. After a while, someone piped up, “This is really hard.” Each of the coffees was different, everyone agreed, but the ice muted their flavors just enough that intense focus was necessary. More than a few times, these seasoned iced coffee drinkers did not like what they saw, smelled or tasted. Everyone tried to guess where the coffees came from. Here are some of the comments judges made about each brew before they knew what they were tasting. Frances: I thought the smell was really sweet. The others smelled fishy or burnt; this smelled almost floral. I thought this was really well balanced. Margot: I wasn’t crazy about it. It tasted like coffee that had been sitting around in a pot. But it was one of the last I tried, so maybe it was watered down. Megan: I liked this one. It tasted toasted with the milk. It kind of reminded me of coffee yogurt; it almost had a “cliché” coffee flavor. Pamela: This was actually one of my two favorites. I really like the caramel-y flavor of the roast — it came through the cold, and stood up to the fat in the milky version. It’s pretty rich but not overly roasted. Cheryl: It tasted a little burned. Dan: I got a little of that, too — lightly burned. Megan: This was my favorite. This one was so bright. It pops! It had this earthy balance and brightness. It was the only one in which I could really smell something. With the milk, it added a new dimension — the milk brought out this luscious, caramel flavor. Pamela: I thought it was really bitter. I might like it better with sugar. Frances: I thought this one tasted almost diluted. It smells like hotel coffee. Margot: I thought it was a lot better with the milk than without. It had a nutty taste to it. Without the milk, it was acidic and watery. Dan: I’m pretty sure that’s Starbucks. Megan: My first reaction was, ew. This was super tangy. It reminded me of grapefruit juice, bitter and tangy at the same time. With milk, it tasted grassy. Dan: I though it was pretty mild, especially with the milk. Pamela: I thought it was fairly balanced originally, but then I thought it was weak. There wasn’t enough coffee in the coffee. Margot: I thought it was cardboard-y with the milk. It was faintly acidic but way too weak. Frances: It tasted overbrewed or old. Cheryl: It tasted like standard, average coffee. Cheryl: I thought this one was pretty neutral. Pamela: Somewhat bitter and flat, kind of ashy. I thought the milk made it better. Frances: This smelled like fish, old fish. It was flat and bitter. Megan: I tasted some sort of spice in there, some sort of combo of cinnamon and something from the earth. It was something I couldn’t quite place. Margot: It kind of has a burned taste and is watery. It was OK — it just didn’t have enough body to it. It was more watery with the milk. Dan: The milk overpowered the whole thing. What’s surprising to me is that it was so mild. Cheryl: This is one of the earthiest ones. Dan: When I smelled it, it reminded me of motor oil, or of gas-station coffee. I have this kind of perverse appreciation for gas-station coffee — sometimes there’s really nothing better. I really enjoyed it with milk. Frances: This was one of my two favorites. I didn’t think it had that much of a negative edge; it didn’t taste burned or overdone. Pamela: It tasted very round, balanced and rich, even with the milk. Margot: I described the flavor as “burned”; it definitely had that deep, full-bodied flavor. Megan: This feels like digging into the ground. I didn’t like this one at all. With milk, it tasted like nothing. Sorry to rain on your parade. Frances: This smells burned, dusty, dirty … like a group of dirty motorcycle men. Megan: It smelled like Pepsi. But I thought it was lemony in flavor. Cheryl: I thought it was bright. Pamela: It smelled like dirty socks. I thought the milk helped — it balanced the smoke. Without it, it was too ashy. Margot: It kind of reminded me of coffee-flavored water. Dan: I thought it was surprisingly similar to [Speeder & Earl’s]. Frances: It smelled like whiskey — smoky, or like Scotch. Megan: I thought it tasted like burned leaves, like spinach or broccoli dressed up as iced coffee. Margot: This was malty and sort of chocolaty. It reminded me of instant coffee, but stronger. I was wondering if it was flavored. Pamela: It had this weird flavor that I could not place. My first impression was ew, nasty. Dan: Acetone? It reminded me of bad tequila. With milk, it reminded me of bad tequila with milk. Frances (looking at the glass): It has an oily surface. It also has the least color — it looks like iced tea. Cheryl: This one was completely weak. The judges were struck by the deep differences among the brews, and nearly as surprised by the variation in their own palates — a flavor that was dreck to some was sublime to others. This augured that no coffee would be a “winner” for all drinkers, and that turned out to be true when the judges were asked to identify their favorites. Two distinctly different blends tied for first place: Maglianero and Starbucks each won over three voters. To complicate matters, though, one of the Maglianero fans also liked the Starbucks, and two Starbucks lovers were also partial to Bluebird Coffee Stop. Then the judges were told what they’d voted for. The least liked coffee was from Viva Espresso — which shocked Frances, who said she often buys coffee there and enjoys it (one person disliked Uncommon Grounds the most). This finding incited a lively discussion about end-of-the-day coffee, burned or old brews, and iced-coffee-making methods. One problem, everyone agreed, was that melting ice soon dilutes even the best brew. Far more than its hot equivalent, we discovered, a great iced coffee is an evanescent concoction. Maybe the Block Gallery is on to something with those coffee ice cubes.